Doreen loved life and loved to learn. She always tried to put others first and make the best of every situation. Her strong beliefs and values will live on in her children, grandchildren and great-grandchildren for many years to come. Margaret “Doreen” was born in Chesley on February 1, 1928 to parents John and Ida (Manley) Harvie. She was soon joined by younger brothers Robert “Bob” and Raymond. Sadly, their Father John passed away when Doreen and her brothers were young. Her Mother was a School Teacher and they lived in various locations for her employment during Doreen’s youth. Over the years their Grandmother, Dorinda Fortune (Manley), was there to help with the children. Doreen attended both public school and high school in Chesley. During an evening out at a dance, Doreen was introduced to a young man by the name of John “Allan” Robson Cook. The two hit it off immediately and were soon married, October 7, 1944, at the manse of the United Church in Southampton. The young couple settled on a farm in Derby Township and before long their family began to grow. They welcomed Fred in 1945, Harvie in 1946, Joan in 1950, Bob in 1955 and Marion in 1957. Doreen was a very resourceful woman and determined to be a good homemaker. She drew on the knowledge of all those around her and worked hard to provide a good home for her young family. In 1953, the Cook family moved to a farm on the 4th of Elderslie. They remained there until 1966 when they moved to another farm in Sullivan Township, near Marmion. Over these years she was involved with the Marmion Women's Institute. She returned to school as an adult to obtain her College diploma as a Personal Support Worker, this in her 50’s! She worked at Parkview Manor Nursing Home in Chesley as a health care aid, a position she enjoyed until her retirement at the age of 65. Doreen had a passion for health care, and was highly effective in this role. As they approached their retirement Doreen and Allan got to spend a lot more quality time together. Camping was something they both enjoyed and they spent several years at Cedar Rail Campground in Scone where they loved entertaining friends and family. Here Doreen never missed the opportunity to enjoy a good camp fire! Doreen’s love of photography allowed her to capture precious memories of family and travel. These beautiful pictures will allow her family to easily recall the many memorable occasions they enjoyed throughout her life. They also enjoyed dancing and entertaining friends and family with their music. Allan was self-taught on the violin and Doreen on the piano (she even took some lessons in her retirement). In retirement they did a bit of travelling. On one trip they saw part of the east coast while visiting her brother Ray and family in Nova Scotia. They also travelled north frequently to visit family, along with trips to Thousand Islands and the US. They moved back to Chesley in retirement to the home where Doreen was born. Although active throughout her entire life, Doreen was able to continue her involvement with her Church, St. John's United, and more specifically the UCW. Doreen was a proud, compassionate, and generous woman who was also practical and determined. She was always up for new adventures. But more than anything, she was a caregiver, not only to her husband and children, but in recent years to her grandchildren and great-grandchildren. Allan's sudden death in 2009 created another challenge for Doreen. This was the first time in her entire life were she was forced to live alone. Doreen used this situation to further learn and grow as an independent woman. As Doreen progressed through her 80’s, she obtained a computer and learned more about technology. She became mildly involved with social media, such as Facebook and YouTube, (yes, you got that right). Doreen continued her love for cards and participated in various weekly local groups in Euchre and Solo. This was an integral part of her life for the past many years and through this, her friendships grew. She also used this time to enjoy her life-long passion for reading. As a young girl, she loved Lucy Maud Montgomery. In later years, she enjoyed romantic novels, anything to do with history or politics, and finally the work of Helen Steiner Rice. 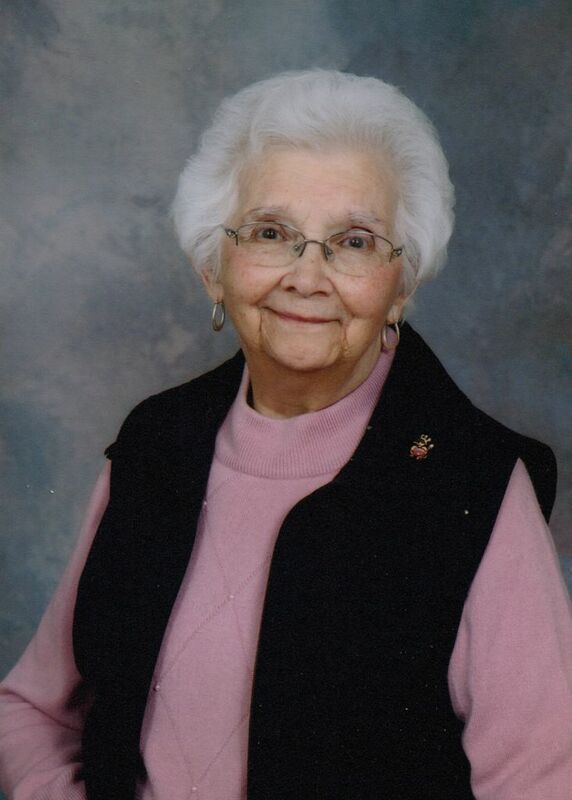 Sadly, Doreen suffered a severe stroke at the end of October and passed away at Grey Bruce Health Services, Owen Sound on Sunday, November 18, 2018 in her 91st year. Loving mother of Fred and his wife Norma of London, Robert and his partner Janice Cook Harvey of Durham, Joan and her husband Mark Farrow of Chesley, Marion and her husband Paul Barton of Stoney Creek and Mother-in-Law of Tena Cook of Owen Sound. Doreen will live on in the hearts and minds of her grandchildren, Steve, Laura, Jennifer, Carrie, Chris, Ashley, Aaron, Paula, Josh, Sarah and Andrew as well as her great-grandchildren Maya, Quinn, Sophie, Tony, Maddie, Brett, Kirstyn, Dylan, Ashlynn, Aidan, Alexa and Ellie. She will be fondly remembered by her brother Ray Harvie and his wife Lillian of Dartmouth, Nova Scotia. Doreen is predeceased by her husband Allan, son Harvie, brother Bob Harvie and her parents, John and Ida (Manley) Harvie. In lieu of flowers, memorial donations to St. John’s United Church or Heart & Stroke Foundation would be appreciated as expressions of sympathy. My sympathy to the family. Your mother was lovely. Joan, thank you for bringing Doreen to my mom's 90th birthday in May. It was a highlight to see the reunion of longtime friends. Sorry to hear of your mom's passing. I was not able to come to the funeral. Was your Uncle Ray there? I have very fond memories of Aunt Doreen and her kind & gentle personality. Thinking of the family and wishing you moments of peace and comfort as you reflect on all the precious times you shared with your wonderful Mom. To the entire family we send our sincere condolences. I didn’t know Doreen as well as her daughter Joan, but what I do know is that Joan emulates everything about her Mother Doreen. What I do know about Doreen was that she was a very dignified lady....a ladies lady if you will. Calm and serene, kind and gentle but very powerful where family was concerned and she was very well respected by all. Doreen’s memory will always remain as her children, grandchildren, and great grand children carry the torch passed onto to them from the matriarch of the family. Let this memory bring comfort to all in the days to come. God Bless. We are so sad to hear of Mom's passing - and yet - we are honoured to remember her LIFE with wonder and joy. She left behind a loving legacy of amazing children and grandchildren. When we hear her name - our hearts smile and beam with delight - just because we knew her. We are so sorry we cannot be there in person to share in the celebration of this loving child of God. I just know that Jesus welcomed her home with the words we all want to hear: "Well done My good and faithful servant!" Our deepest sympathy with Doreen's passing., our thoughts and prayers are with you at this most difficult time. Marion: Thinking of you and your family on the loss of your mother. Sending hugs your way. See you soon. We were sorry to hear of Doreen's passing. I remember Doreen fondly from our time working together at Parkview and then, in later years, as a neighbour. Our sympathy to the whole family. We are sorry to here the passing of Doreen. I remember Doreen working for my Dad at the Red and White in Chesley.She always had a smile for everyone and was very patient with me as I learned how to run the cash register as a kid Dad was very fortunate to have such a reliable lady working with him. Our sincere sympathy in your loss. Not only were Doreen and Allan great family friends but so were the children. Doreen took me in under her wing when I started at Parkview and taught me many things that go along with the job and life in general. Kindness and respect to mention a few could make the job and life more enjoyable and that smiling wasn’t hard to do. For her comfort in teaching me as well as family outtings I will always hold her dear in my heart. Rest In Peace another beautiful angel taken away my thoughts and prayers are indeed with the entire family!! She was a special and kind lady. I enjoyed her visits. My condolences to the families. We extend our deepest sympathy to the Cook family. She will be truly missed and remembered. Our sympathy is extended to the family during this most difficult time. Our deepest sympathy in the passing of Doreen. Our thoughts and prayers are with the family. Lost track of Doreen, but will always remember her as a warm loving person. Our sincere sympathy in the loss of a great lady. Sorry to hear of Doreen’s passing. She was always kind and caring, and will be fondly remembered. I was sorry to hear of Doreen`s passing. I shall always remember her as a kind, gentle person. We treasured her not only as a friend, but as a double cousin. Fill in the form below to send a public condolence.